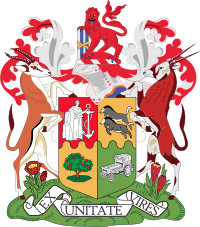 The present coat of arms of South Africa was introduced on Freedom Day 27 April 2000. It replaced the earlier national arms, which had been in use since 1910. The motto ǃke e꞉ ǀxarra ǁke is written in the Khoisan language of the ǀXam people and translates literally to "diverse people unite". The previous motto, in Latin, was Ex Unitate Vires, translated as "From unity, strength". A demi-secretary bird displayed Or, charged on the breast with a stylised representation of a protea flower with outer petals Vert, inner petals Or and seeded of nine triangles conjoined in three rows, the upper triangle Gules, the second row Vert, Or inverted and Vert, and the third row Vert, Or inverted, Sable, Or inverted and Vert. Above the head of the secretary bird an arc of seven rays facetted Or and Orange, the two outer rays conjoined to the elevated wings. The new arms were introduced on Freedom Day, 27 April 2000. The change reflected the government's aim to highlight the democratic change in South Africa and a new sense of patriotism. Or, representations of two San human figures of red ochre, statant respectant, the hands of the innermost arms clasped, with upper arm, inner wrist, waist and knee bands Argent, and a narrow border of red ochre; the shield ensigned of a spear and knobkierie in saltire, Sable. Thereabove a demi-secretary bird displayed Or, charged on the breast with a stylised representation of a protea flower with outer petals Vert, inner petals Or and seeded of nine triangles conjoined in three rows, the upper triangle Gules, the second row Vert, Or inverted and Vert, and the third row Vert, Or inverted, Sable, Or inverted and Vert. Above the head of the secretary bird an arc of seven rays facetted Or and Orange, the two outer rays conjoined to the elevated wings. Upon a riband Vert, the motto ǃKE E꞉ ǀXARRA ǁKE in letters Argent. Issuant from the ends of the riband two pairs of elephant tusks curving inwards, the tips conjoined to the wings of the secretary bird, Or, therewithin and flanking the shields, two ears of wheat Brunatré. The motto is: ǃke e꞉ ǀxarra ǁke, written in the Khoisan language of the ǀXam people, literally meaning "diverse people unite". It addresses each individual effort to harness the unity between thought and action. On a collective scale it calls for the nation to unite in a common sense of belonging and national pride - unity in diversity. An emblem of fertility, it also symbolises the idea of germination, growth and the feasible development of any potential. It relates to the nourishment of the people and signifies :the agricultural aspects of the Earth. The figures are depicted in an attitude of greeting, symbolising unity. This also represents the beginning of the individual’s transformation into the greater sense of :belonging to the nation and by extension, collective humanity. A dual symbol of defence and authority, they in turn represent the powerful legs of the secretary bird. The spear and knobkierie are lying down, symbolising peace. The protea is an emblem of the beauty of our land and the flowering of our potential as a nation in pursuit of the African Renaissance. The protea symbolises the holistic :integration of forces that grow from the Earth and are nurtured from above. The most popular colours of Africa have been assigned to the protea – green, gold, red and black. The secretary bird is characterised in flight, the natural consequence of growth and speed. It is the equivalent of the lion on Earth. A powerful bird whose legs - depicted as the :spear and knobkierie - serve it well in its hunt for snakes, symbolising protection of the nation against its enemies. It is a messenger of the heavens and conducts its grace upon the Earth. In this sense it is a symbol of divine majesty. Its uplifted wings are an emblem of the ascendance of our nation, while simultaneously offering us its protection. It is :depicted in gold, which clearly symbolises its association with the sun and the highest power. An emblem of brightness, splendour and the supreme principle of the nature of energy. It symbolises the promise of rebirth, the active faculties of reflection, knowledge, good judgement and willpower. It is the symbol of the source of life, of light and the ultimate wholeness of humanity. The first coat of arms was granted by King George V by Royal Warrant on 17 September 1910. This was a few months after the formation of the Union of South Africa. It was a combination of symbols representing the four provinces (formerly colonies) that made up the Union. The two wildebeests of the second quarter represent the Colony of Natal. The supporters are taken from the arms of the Orange River Colony and the Cape Colony. 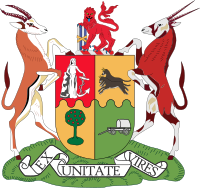 The lion holds four rods, bound together, symbolising the unification of the four former colonies. Three official renditions of the arms were used. The original rendition (1910) was the only version used until 1930, and it continued to be used as the rank badge of warrant officers in the South African Defence Force and South African National Defence Force until 2002. The second version, painted in 1930 and known as the "ordinary coat of arms", and the third version, painted in 1932 and known as the "embellished coat of arms", were both used until 2000.